MormonInfo.org - Mormon Oriented Movies - Mormonism: Has Anything Changed? 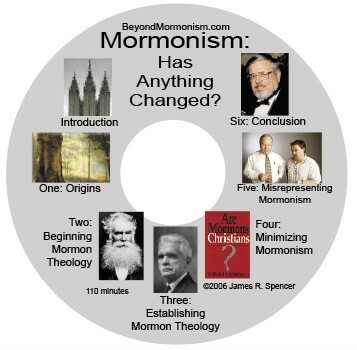 The film Mormonism: Has Anything Changed? was produced and narrated by James R. Spencer, the author of the book Beyond Mormonism. The film primarily deals with the erroneous belief that Mormonism is becoming more like Christianity. It has become a popular belief within certain Christian circles that the Church of Jesus Christ of Latter-day Saints is on the verge of true spiritual transformation, and that it may soon evolve into a mainstream denomination. I remember hearing from Greg Johnson, who is the founder of Standing Together Ministries in Utah, that he believes the Mormon Church is in a crucial transformation period--the likes of which nobody has ever seen before, a transformation into true Christianity. With the help of a powerful PR strategy by the LDS Church, and the help of Bob Millet from BYU, Greg Johnson and many others have seemed to be romanced into really believing this. James Spencer makes it clear in this video that Mormonism has not changed its doctrines or practices, but it has simply minimized some of its beliefs to appear more desirable to the masses. Spencer gave Bob Millet the nickname "Minimizing Bob" because Millet has a knack at minimizing the differences between Mormonism and Christianity to such a degree that even Richard Mouw, president of Fuller Theological Seminary, has been tricked into thinking that "Minimizing Bob" believes in the biblical Jesus Christ for his salvation. I am grateful that Spencer took them time to address this very important issue. The video began with an introduction and a rather lengthy overview of Mormonism to give the viewer an understanding of historical Mormonism. I felt the overview was overkill. There really wasn't a need to explain Mormonism in such detail for such a long time, and it made the video somewhat boring to the viewer who was already familiar with the LDS Church's teachings. The most interesting part of the video, however, was near the end during a relatively brief discussion about Bob Millet's dialogues with Greg Johnson at Idaho State University. I felt he could have spent the entire time uncovering Millet's deceitful, and manipulative interactions with Johnson and his audience. I have been to one of Johnson and Millet's dialogues at a Mormon ward, and Millet was so manipulative with his explanations of Mormon doctrine that many Christians in the audience were confused into believing that there was no difference between Christianity and Mormonism, and the LDS audience was thrilled to be affirmed about their "Christian" beliefs. By referring to the texts of which Bob Millet would quote in the video, Spencer uncovered how Bob Millet would intentionally deceive the audience into believing the LDS Church teaches or does not teach something--all in order to make Mormonism come out rosy. Another enjoyable feature of the film was how Spencer would play back to the viewer what Bob Millet said in a recorded presentation to a strictly Mormon audience, and compare it to what he would say to a mixed crowd. You would think that Bob Millet was schizophrenic. Through this film you get a good insider's view of how the Mormon Church works to manipulate the masses, including Dr. Richard Mouw, into accepting Mormons as Christians, and understand the fact that the Mormon Church really has not changed in any significant direction towards transformation. In regards to the production side of the film, this is an extremely low budget film, and it mainly consists of James Spencer narrating in front of the camera. You can tell that he was reading the scripts, which got annoying at times. I felt that he did an adequate job in integrating other video clips to demonstrate his point, and the film was edited decently. Overall, I felt this film accomplished what it intended to, but could have focused less on the overview of Mormonism and more on the Johnson/Millet exchanges. I would recommend this film to Christians interested in learning about Mormonism, since it provides a good overview, and to people who have attended the Johnson/Millet dialogues in the past or plan to in the future.